The CV-E3T3-TTX is an Ethernet bridge connected over an E3 or T3/DS3 clear channel G.703 link. This converter is used to deliver 100BaseT with 34/45Mbps over TDM networks by Telcos, ISP and in the enterprise environment. 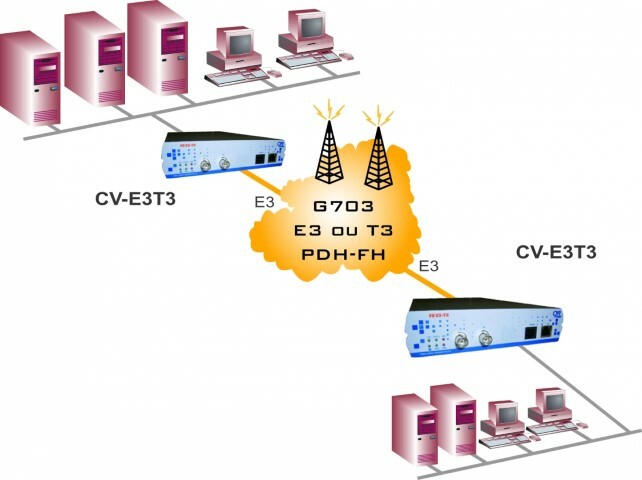 The CV-E3T3-TTX is connected directly to the E3/DS3 output (takes a full VC3) of a SDH/SONET switch or theE3-34 Mbps or T3/DS3-45Mbps interface on a Microwave Radio. If the distance is too great, an E3 connection to the LAN can be extended by replacing one or two sides of the CV-E3T3-TTX with a pair of FO-E3T3-TTX and fiber optic cable.